Want to treat your partner to a weekend break where you can just relax and enjoy time together? If Milton Keynes is the place you fancy, then we have just the accommodation to entice you. Our one-bedroom and two-bedroom serviced apartments have the space and the added extras such as a fully equipped kitchen, dining table and open-plan living area with a special SKY TV package so you can spend a week-end in. Or, venture out to enjoy what this vibrant town has to offer, knowing that there is a cosy apartment to return to. To make your Valentine weekend break even more memorable, your reservation will include a range of complimentary Valentine themed gifts – in addition to our usual complimentary gifts of fresh milk, cereal, biscuits and toiletries -on arrival at your apartment as a ‘thank you’ for booking with us. Book for Friday 12th and Saturday 13th February and receive Sunday 14th February totally free of charge! Don’t want the additional night? Well, instead you can enjoy a complimentary late check-out and leave when you are ready – you can’t beat a lie in on a Sunday! Prepare a romantic meal in the fully equipped kitchen in your apartment, then relax in the spacious living-room before submerging yourself into a hot bubble-bath with your Valentine’s duck for company! 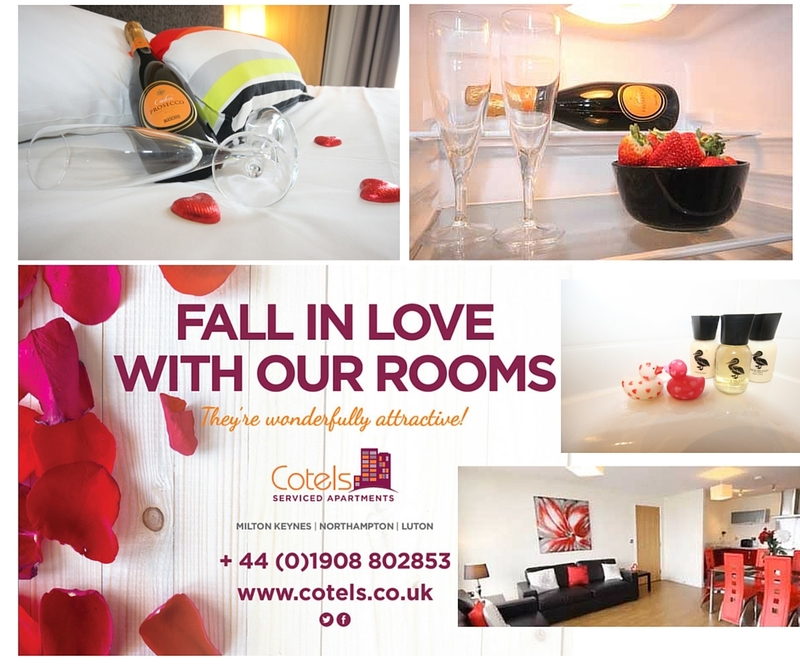 To book your Valentine’s weekend special Book Online or call us on 01908 802853.